We just received some sad news by email. My bear friend Emma has passed away peacefully in his sleep at the Animals Asia sanctuary. He was a lovely friend and I will miss him. He was a very big bear, being part brown bear and he was very active. He enjoyed playing outside, swimming in the swimming pool, wrestling and running with his bear friend Hans and playing with his enrichment toys. I am proud to have been his friend. 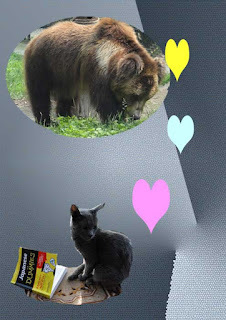 Maybe we will meet at the Rainbow Bridge at last and Emma can show me bear life in the forest. I have put my Valentine's card to Emma here so you can see what he looked like. for not even posting my friends comments to my blog. I have been unable to get Lynettea to pay any attention to mE ME ME lately, other than giving me food and water and reheating my snugglesafe and brushing me a couple of times a day. No attention has been given to my intellectual interests. I only get proper attention if she has visitors. It is too cold on my furs to go out much, particularly if it is raining. I have had a couple of walks up and down the street being carried by Lynettea (she says carrying me helps keep her warm). Not today though, as it is raining. She only went out to get my food at the chicken shop. My friends I am sorry I haven't been able to visit your blogs either. Maybe I should attempt to go home with one of the visitors. Lynettea might prevent me, as she is very selfish. She might suddenly, at the last minute think of ALL I DO FOR HER!!!! Today some of Lynettea's friends came to visit and look at a film. They are much more considerate than she is. I heard her tell them that she would move me off the sofa, but one of them immediately said she would move to the middle of the sofa so I could have my own bed. So not all humans are thoughtless and unkind. post more photos of me without letting me look at them first. I will have to change the password of my blog. I suppose because it was 'Wordless Wednesday' she would get away with it, as we know she can't write in my distinctive 'voice'. Like any famous author I have my own way of expressing my opinion.